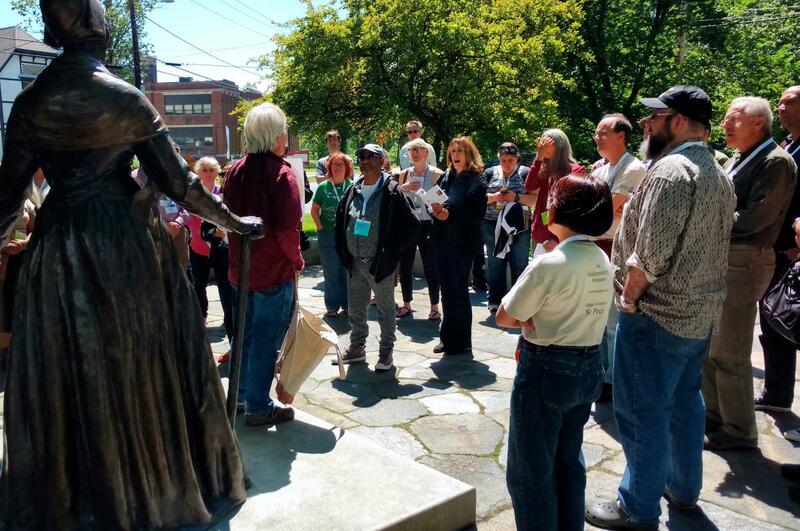 In June, 420 leaders from over 100 food co-ops across the U.S. gathered at UMASS Amherst for the 60th Annual CCMA, the Consumer Co-operative Management Association. The conference was hosted by the Neighboring Food Co-op Association (NFCA), a federation of 35 food co-ops across our region and local hosts Franklin Community Co-op and River Valley Co-op. It was the first time that CCMA had been held in New England in over 15 years. Organized around the theme, “Disrupting the Future: Co-operative Food & the Next Generation,” the conference offered an opportunity for food co-op board members, staff, and organizational partners to share ideas, explore issues of diversity and inclusion, and develop strategies for operational excellence. These presentations are the topics presented by NFCA staff and board members with partner organizations. The NFCA, Cooperative Fund of New England, and Hunger Free Vermont have worked with NFCA members to implement programs addressing food access and community ownership. Since 2014 seven NE food co-ops have implemented new “Food For All” programs, making healthy food and co-op ownership more accessible to people with limited incomes. This presentation covers how regional co-op collaboration and strategic partnerships helped neighboring food co-ops across New England address food access, enhance community identity, increase the collective impact of co-ops on food security, and how working with USDA helps ensure this model is sustainable and replicable across the country. Since 1967, the Federation of Southern Co-operatives (FSC) has worked to increase incomes, support economic development, and assist in land retention, especially for African Americans but essentially for all family farmers in the Southern US. This presentation focuses on efforts to develop regional marketing and food distribution systems that can link co-operative communities in the South with those in other parts of the country through trade. The Principle of Co-operation among Co-ops speaks to the advantages for co-ops and their members working together through formal regional, national, and international co-operative structures. The Neighboring Food Co-op Association (NFCA), a federation of 35 food co-ops and start-ups across New England, grew out of dialog among food co-ops on what we could accomplish by working together. This presentation provides an in-depth look at NFCA structure and successes, future vision, and provides insights on how food co-ops can work together regionally to support shared success and collaboration at all levels, growing the co-operative economy together. Many of our member co-ops are facing new and serious challenges due to competition, financial pressure and/or conflicts between stakeholder groups. Opportunities for growth and success require a high level of collaboration. More than ever, food co-ops need to develop strategic alignment between the governance and operational aspects of their organizations. This presentation explores some of these challenges and opportunities and offers some examples from food co-ops in our region.